@realDonaldTrump – Page 7355 – Did Trump Tweet It? Posted using Twitter Web Client. This tweet was probably written by staff. 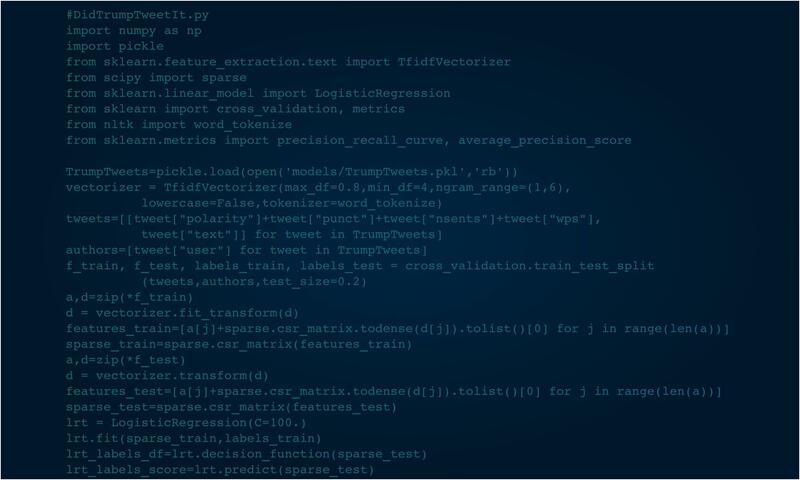 This model really predicts the probability that this tweet is consistent with those posted with Android devices and inconsistent with those posted with iPhones up until Mr. Trump’s inauguration. The assumption in assigning authorship is that only Mr. Trump wrote those Android tweets and his staff wrote the others. Click here to learn how this all works. Barney Frank admited that ObamaCare does have ‘death panels’ yesterday. Obamacare must be fully repealed or healthcare will be destroyed. Barney Frank admited that ObamaCare does have 'death panels' yesterday. Obamacare must be fully repealed or healthcare will be destroyed. This tweet may have been written by staff. With a record deficit and $15 trillion in debt, @BarackObama is spending $4 million of our money on his Hawaii vacation. Just plain wrong.